Frozen pipes aren’t just inconvenient – if they burst, just a small crack can release hundreds of gallons of water into your home, damaging carpets, floors, walls, the ceiling below and anything else that happens to be in its path. Keep the thermostat set to at least 60 degrees. Insulate pipes in crawl spaces, attics and basements. These exposed pipes are the most susceptible to freezing. Wrap exposed pipes with heat tape or thermostatically controlled heat cables. Be sure to use products that are UL-approved and follow the product and manufacturer instructions. Turn off outdoor faucets and disconnect hoses. Seal any cracks or holes near pipes with caulk or insulation to keep cold air out and warm air in. Open indoor cabinets where pipes are located to allow warm air to circulate around them. Allow faucets to drip slowly, both hot and cold. If your pipes do freeze – don’t wait for them to burst, take action right away. Try to thaw frozen pipes by introducing heat to the space around the pipe with a space heater, hair dryer, heating pad or other electrical device. (DO NOT attempt to thaw a pipe with a torch or open flame). Start from the end nearest the faucet and work your way back. If you are not successful, call a plumber. The worst case scenario – a burst pipe. 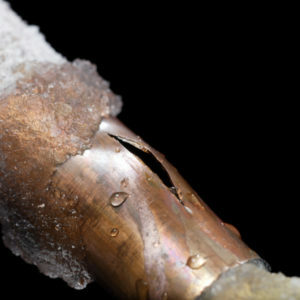 If your pipes freeze and burst, turn off the main water valve and call a plumber immediately. To mitigate damage, place a receptacle or plastic sheeting to catch water, clean up all water immediately and remove any items that could be damaged. If there is water damage, contact your Independent Insurance Agent as soon as possible. Try to make a list of any damaged items and save all receipts associated with the damage. needs. Great for seasonal and secondary homes as well! Ask your Independent Agent today how you can qualify for a credit with MMG when you install a water flow alarm in your home.